Discover Financial Services’ Diners Club International is launching its first global entertainment partnership with Twentieth Century Fox. The two brands have teamed for the movie release of "Life of Pi," a story of survival that chronicles the shipwrecked journey of a boy and a Bengal tiger. 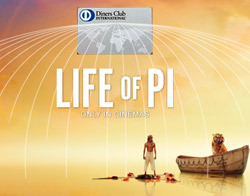 The promotion includes print, Web banners and TV spots that combine creative elements from “Life of Pi” and the “Belong” campaigns. Twenty-three Diners Club franchisees across the globe are also using and customizing these creative elements in their own region-specific marketing plans. It also includes a global photography contest encouraging aspiring photographers to submit a photo online at www.talenthouse.com that creatively illustrates a significant journey in their own lives. The deadline for entering is Jan. 3. Entries will be judged based on creativity and uniqueness by Claudio Miranda, cinematographer for "Life of Pi," and others. One winner will receive a grand prize of $5,000 and will be featured in an upcoming Diners Club International advertisement. The brand is promoting the contest and partnership on its Facebook page at www.facebook.com/dinersclubinternational. The inspiring message in this film resonates with the Diners Club “Belong” campaign, which recognizes and celebrates the life journey of the brand’s cardmembers, said Eduardo Tobon, president of Diners Club International. “I believe the future of Diners Club holds many possibilities, one of which being partnerships that bring our brand to life,” Tobon said in a release. Diners Club is “incredibly excited” to promote a film that celebrates a unique, transformative journey, said Janice Alfini, senior vice president of global brand and marketing at Diners Club International. “We value this unique opportunity with Twentieth Century Fox and will continue to look for other innovative ways to provide Diners Club franchises and card members world-class benefits,” Alfini said in a release.